Guna is a Sanskrit word that can be translated into ‘quality, mode or attribute’. There are three modes of material nature: Tamas (darkness/ignorance), Rajas (excess/passion) and Sattva (goodness/balance). It is believed that all beings, objects and activities in the material world have a combination of all three modes, varying only in quantity. For example: Imagine you have baked a cake for your relative on their birthday. Something upsets you during the day and then you accidentally eat the whole cake yourself, not giving it your relative. Afterwards, you have a tummy ache and feel really guilty. In this simple example, you can see all three qualities of nature at work. The intention of goodness is Sattvic. Afterwards we see Tamasic qualities creep in in the way of depression and/or anger. And lastly, the decision to obsess on emotions and allow us to behave in an excessive manner is Rajasic. It is believed that the levels of each Guna in our lives can be controlled. This has a direct effect on your overall happiness on earth and determines your progress in life. 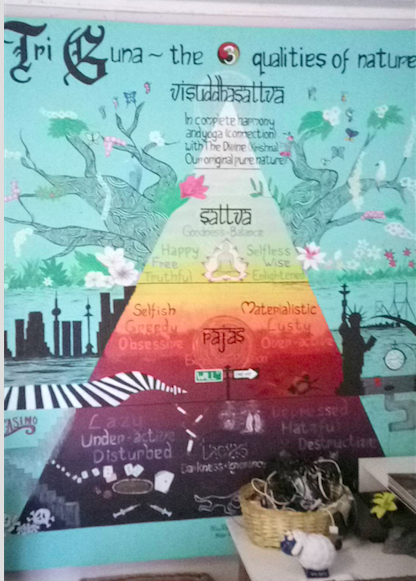 The pyramid of the three modes - painting by our dear friend and volunteer Nina Reingoldt in 2014. Sattva is the quality of goodness and stability. Experiencing high levels of Sattva, we feel happy and content - a healthy and sustainable lifestyle. Sattvic actions and objects feel good to do and be around. There are no negative effects. Rajas is the quality of being active or agitated. Things like binge watching Netflix or an addiction to coffee fall into this category. Rajasic things tend to feel really great at the beginning but have a less than favorable long term effect. If we live in the mode of Rajas long term, constantly on adrenaline, we are prone to burn-out. The mode of nature we call ‘Tamas’ refers to qualities we better stay away from. They are seen as darkness and ignorance. Things and activities in this quality feel less than favorable and have a long term negative effect on us and the people around us. Summing it up, we should strive to promote Sattva in our lives, and introduce Rajas wherever necessary to ‘get stuff done’ and be in an active, creative mode. Tamas is necessary in the form of sleep or relaxation, but should be kept very limited otherwise. In the Bhagavad Gita, the mode of goodness is considered the platform we need to reach in order to be able to have a sustainable and stable spiritual life. Before we can reach higher states of consciousness, we need to become conscious first. The more we transcend and let go of stress, egotism and material distractions, and are in touch with our true selves, the better we can connect to our Higher Self and - ultimately - the Divine.